This Lift-a-Flap edition will keep children ages 6 and under busy for hours as they learn about Noah's ark and the flood. Featuring bestselling Beginner's Bible artwork. All Aboard with Noah! by Catherine Devries was published by Zondervan in March 2009 and is our 24874th best seller. The ISBN for All Aboard with Noah! is 9780310717263. 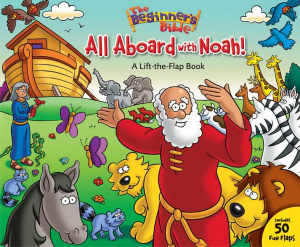 Buy Together Offer for All Aboard with Noah! Reviews of All Aboard with Noah! Be the first to review All Aboard with Noah!! Got a question? No problem! Just click here to ask us about All Aboard with Noah!. Details for All Aboard with Noah!